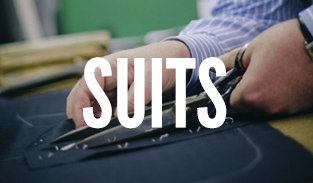 We've spent over forty years putting some of Britain's best known people in some of its best made suits. But it's not just who you know. It's also what you know. And, for us, that's how to make every man a gentleman. We may have been established by Mr Redwood & Mr Feller back in 1946,but Edward Rowland has been at the helm since 1974, bringing the cut and tailoring of Savile Row to Pimlico, and being awarded the Royal Warrant in 1986. Now, all these years later, he’s still here, working alongside his son, Elliott. Together, Father and Son ensure Redwood & Feller remains a truly personal and bespoke service. 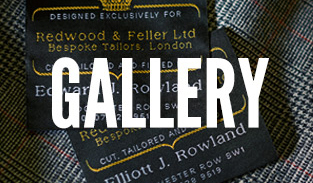 Here at Redwood & Feller, we pride ourselves on making the finest bespoke suits London has to offer. All of our British made garments are cut and made by hand in our workshop, in the heart of Westminster. With over twenty years in the trade, our coat and trouser makers have been trained to the highest standard. We believe at Redwood & Feller, it's not only what you see on the outside which makes a beautiful suit, but also the craftsmanship and man hours which have gone into it, these elements together make a truly bespoke suit. A well cut, tailor made garment should never go out of fashion, but instead, be built to last the test of time.